The universal laws are your user manual for living an abundant and fulfilling life. Most people who want to improve their quality of life do so by trial and error until they find the right formula. The majority of people on the planet are not even aware that they have a choice; they don’t know that they can take control of their life and make constructive changes simply by consciously aligning with universal laws. This an immutable law. It’s immutable because we can’t change or influence it. However, knowing how it works allows us to use it to our advantage and for the highest good. At its core everything is pure energy, and everything vibrates; that includes the whole kit and caboodle (as they say), both animate and inanimate objects including, but not limited to, colors, sounds, words, etcetera. As above so below. The cosmos vibrates, the planets in our solar system vibrate, our thoughts vibrate, and we vibrate. Our individual energy signature (vibration) is established as a result of our thoughts, feelings, emotions and beliefs. And those will be a high vibration or a low vibration depending on how we feel in the moment. Our vibrations establish a resonance with anything else that has the same frequency. If you want to know the nature of the vibration you’re sending to the universe, notice how you feel. If you feel good, happy, joyful, etcetera, you’re emitting a positive vibration. On the other hand, if you’re feeling sad, depressed, fearful, or negative in some way you’re emitting a low vibration. Another way to determine the quality of your vibration is to look at the quality of your relationships and circumstances. The quality of your life is a direct result of the quality of your energy signature. Our vibration affects everything around us including other people, animals, plants, even inanimate objects (inanimate objects are pure energy as well). We, in turn, are affected by the vibration of our environment and what or who is in it as well. It’s an exchange of energy. That is why it’s important that the people we spend most of our time with are supportive and positive thinkers and our living space feels good as well. You may have had a feeling about a person or place that didn’t feel good or conversely felt great because you were tuned into the vibration of that person or place. It’s good to know how the Law of Vibration works because this knowledge makes us aware that all we need to do is maintain the vibration of that which we want to be, do or have in life! I know that’s easier said than done. However, the more we become mindful of our thoughts and feelings, the easier it is to maintain positive life-affirming thoughts which affect our vibration and our life in a positive manner. You’ve probably heard the phrase “Like attracts like.” That saying refers to the vibration of the person. This is known at the Law of Attraction. For example, if a person has a negative attitude, they are going to draw negative people and unpleasant circumstances into their life. On the other hand, if an individual has a positive outlook on life, they are going to attract positive individuals and circumstances. Everything vibrates – everything. If you want to draw something into your life all you need to do is match its vibration. If you want more love, be loving. If you want to attract prosperity, entertain thoughts and feelings of being prosperous. If you want better health, feel yourself being healthy. Since everything vibrates, our thoughts are included. Our thoughts, feelings and emotions carry a specific vibration. The frequency we are vibrating at sends a signal which is returned to us in kind via The Law of Resonance and The Law of Attraction. Like attracts like. Our current circumstances are the result of our previous thoughts, feelings, emotions, and beliefs. You may be thinking, okay, fine, so how do I change my thoughts, feelings, emotions, and beliefs? First off, it takes work and commitment. After harboring the same or similar thoughts, feelings, emotions, and beliefs for many years they are not going to change in an instant. However, the more consistently you practice the easier it becomes. There are a few ways that have been proven to effectively make change: mindfulness, hypnosis, and self-hypnosis are the ones I prefer. These approaches seem to help more people to make the appropriate changes faster and easier. They sure have for me! It’s imperative that we maintain a high frequency (vibration) throughout our day rather than just once in a while. Greetings, dear ones. Your planet is experiencing a time of great change. Each and every one of you are experiencing a major shift as well. This, dear ones, this is an extraordinary opportunity; a time of choice, a time of quantum growth potential. This is a unique time, a grand time on your planet, and a grand time for the cosmos. You have the ability to make unparalleled changes within yourself and your planet. You are creating your world via your thoughts, your feelings and your actions. You are also creating your group environment and the experiences of your planet as a whole, via your group consciousness. Your point of focus is of paramount importance during this period. Your point of focus determines what you are creating, what you are manifesting in your life, and in your world. This is an opportunity to make grand changes; to make quantum leaps in your spiritual development, in the growth of you as an individual and the growth of your planet. We ask that you consider focusing on that which you wish to create, rather than what you see and experience in the world. If you wish to see your planet at peace, we encourage you to see the planet at peace, to feel yourself at peace – to experience the feeling of peace. We encourage you to focus on what you would like to see and experience in your world. You have free will, dear ones; it is your choice. It is always your choice whether you choose to employ in your life what we share. When interacting with another human being, we invite you to look at their good points. Find something to appreciate or love about them; something that will bring forth the light, something that will allow their light within to shine brighter. As you do so, the light within you will shine brighter as well. This is an opportunity for unprecedented leaps; you make these quantum leaps via your point of focus. We encourage you to focus on the good within your world. We encourage you to focus on the good within yourself. We encourage you to maintain a high vibration, by placing your attention on the way you want your world to look – feeling the pleasure of that experience, rather than the way it appears. When you focus on present discordant circumstances, you are reinforcing and re-creating the same experience; you are giving energy to that which you focus on. When one wishes to change their circumstances or their world, it is imperative to hold the vision, hold the feeling of the New World, the new reality you wish manifest. These are suggestions should you choose to follow them. You have free will; you have the ability to make your own choice for your highest good and the highest good of all. You are a sovereign being, and only you can make these choices; only you have the ability to change your circumstances and your world, through your thoughts, your feelings, and your actions. Should you choose to do this, dear ones, know that we are watching. We are encouraging you. We are applauding you. 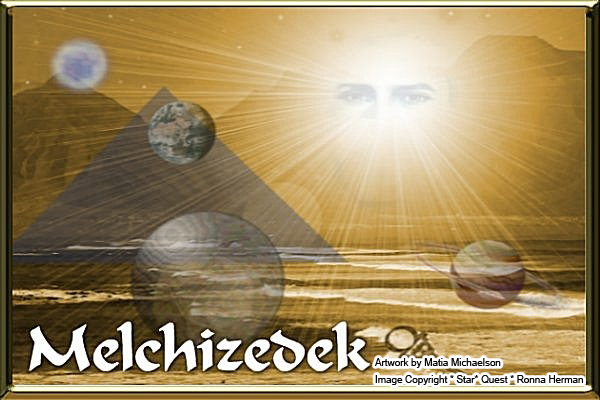 This is a timely topic that Lord Melchizedek has been nudging me to bring forth. I addressed focusing on the solution rather than the problem in previous posts. In this post, I’ll share a few ways in which I redirect my focus. There are numerous current events and potential events that can draw us into them, if we allow the drama to pull us in. When we find ourselves focusing on these distractions – by dwelling on them, worrying about what might happen, or discussing them in detail with others – we are giving energy to those situations. When we do that, it is normally accompanied by an uncomfortable feeling, as if we are not quite centered. If you wish to change your point of attention, change the direction of the conversation when it moves in a direction you would rather not take. When you find yourself worrying about something, stop and focus on something that makes you feel good. When I find myself thinking about a potential catastrophe, or something else of a lower vibration, I redirect my thoughts to the opposite, or something totally different that makes me feel good. For example, let’s say I see something on the internet that talks about the possibility of a pole shift, resulting in a disaster. That is no problem as long as I do not dwell on the subject, giving energy to it. If I do find myself harboring that thought too long, I will think of, see, or sense the earth as a balanced, joyful place with people living in harmony, enjoying life. Or, I may shift my attention to someone or some place that I love. Or, I may say “Cancel, delete” and focus on something else. When I’m in a conversation with someone who brings up something about some current or possible calamity, I may talk with them briefly about the subject, but will eventually direct the conversation to a different topic. If they persist with the subject I may even tell them that I don’t wish to dwell on that topic, explaining that we give energy to that which we focus on, changing the direction of the conversation. As stated above, if I find myself worrying about something, I might say “Cancel, delete” and change my focus. Say “STOP,” then focus your attention on your breathing for a moment or two to center yourself and be present. Determine what threw you off-center by asking what it was. In many cases, you won’t have to ask because you’ll know right away what you were thinking. After you determine what you were worrying about, acknowledge that you were worrying and move into the energy, into the feeling. That alone will allow the energy and worry feeling to partially or completely dissipate. The next step is to create a short affirmation of the opposite and then move into that feeling. For example, if you found yourself worrying about finances, you could say something like, “I allow myself to enjoy financial abundance,” then move into that feeling. Alternatively, you could ask yourself, “What would it feel like to be outrageously prosperous?” or something similar. Remember, it is important to move into the feeling each time, and to feel grateful for your prosperity. I cannot over-emphasize the importance of getting into the feeling. Feel gratitude for the subject of your affirmation as if you already have it, which is the opposite of what you were worrying about. Stop – Say STOP and stop worrying. Question – Determine what is bothering you. Embrace – Embrace the energy and allow it to dissipate. State – State opposite affirmation. Feel – Feel gratitude and/or appreciation for your creation (affirmation). Greetings beloveds. We come forth this day with a message regarding the changes and challenges you are experiencing in your world and your life. Your planet, according to your television and radio news programs, appears as if it is falling apart. The truth is that, in a sense, it is. It is crumbling so that something better can be manifested by your group consciousness, which comes after you have altered your individual thought patterns. You will continue to see your human structures of finance, government and big business as well become ineffective within the higher frequency patterns coming forth at this time. This is necessary so that institutions of a higher vibratory rate can be erected, structures that will be in harmony with the higher frequency levels of the fifth dimension. Most of your current creations are of a third-dimensional frequency pattern which, as you can see, will not withstand the higher vibrations of the fourth and fifth dimensions. These energies of duality are archaic and will not be supported by the higher frequencies within the dimensions you are moving into. As your individual vibrational patterns and the collective pattern expand into a more refined vibration, structures will come into place at a suitable time and in the appropriate manner. First, you as individuals change your frequency patterns; then as a result, the group consciousness will move to a higher vibratory rate. Planet Earth is in the midst of a transformational process as well, which is necessary in order to move from the third dimension through the fourth and into the fifth. Many of you have heard the phrase “Out of chaos comes order” and that is what is taking place upon and within Gaia at this time. It is also happening to many inhabitants of Gaia. Life is in chaos and is being reshaped by an increase in awareness and frequency. Those who cannot make the shift this round will do so at another time. As an inhabitant of fifth dimensional Earth, it is necessary that you have compatible frequencies. You are being given the opportunity to change your consciousness while in your body. However, some may decide to discard their bodily form as they move to another expression of awareness. The demise of your physical vessel is merely a change in consciousness, for the essence of your being will never die. Either way, it is a good thing, dear ones. The changes we talk about and that you see before you are opportunities to move beyond your current level of awareness to a higher state of consciousness. We encourage you to consider the challenges you face, and will face, as opportunities to move to the next level in your spiritual evolution, as you remember and embody who you truly are – a facet of God. This is what you have been waiting for, dear ones; you are in the midst of an auspicious event. This is a lifetime of rare opportunity. You are here at a pivotal time, on a unique planet, experiencing a monumental transformation into a new level of existence. We encourage you to step into your divinity and strive to become all that you can be. You have within you all the necessary tools, wisdom and knowledge to move through this with ease and grace. You have the means, dear ones, for you were created in the image and likeness of the Creator. Remember who you are and embrace your power. Love is a powerful transformative energy that will help you on this journey, should you choose to use it. Love enables you to transmute lower frequencies, because it vibrates at an ultra-high frequency. Higher energy patterns always override lower energies. Therefore, as you embrace the frequency of love, you raise your vibration and draw higher vibrational events into your life. And, as you do so, you affect the whole by raising the frequency of your group consciousness. Appreciation creates a high vibration as well. You can shift your vibration from a low frequency to a high frequency by loving or appreciating the people in your life, nature or your day to day challenges, for example. That includes loving and/or appreciating yourself. Another of your words that holds a high vibration is gratitude. As you feel gratitude, you increase your frequency as well. As you walk the path of expansion, which is eternal, we will forever be there to assist you, at your request. Every challenge provides an opportunity for growth, and in some cases, a quantum leap. Many of us have a habit of looking at obstacles in life as bad things, and they can be when we look at them that way; on the other hand, when we look at life’s complications as opportunities for personal growth, our energy shifts, and so do the dynamics of the situation: our vibration increases, our energy rises, people enjoy our company more, and problems are solved in an easier and timelier manner. This practice makes a vast difference in our life and the lives of people we interact with. Who would you rather spend time with, a person who has a positive outlook on life, or someone who is always complaining about something? Of course, when we complain we create more of that which we are complaining about… we keep digging the hole deeper. Our outlook is the essential key. When we approach a problem with an open mind, focusing on the solution rather than the problem, the solution reveals itself. When we focus on the problem rather than the method to resolve the situation, it grows larger and becomes even more daunting. The whole energy around the obstacle changes when we look at a challenge as a gift rather than a bad thing and place our attention on the way out. When we focus on the good in our world rather than the problems, we draw more beneficial karma our way. It is simply a matter of cause and effect. Focusing on the good in other people and our world brings more good people and pleasurable experiences into our environment, thus eliminating problems before they become an issue. When we encounter difficult people, they are mirroring some aspect of ourselves back to us. When we have problem after problem, we are being shown something about our thoughts and beliefs that can be changed and must be changed if we want to make positive changes to our life. Many, and probably most, of our thoughts and beliefs are the result of our environment at an earlier age, coming from parents, teachers, relatives and friends. In The Spontaneous Healing of Belief, Gregg Braden tells us that we acquire most of our beliefs during our early childhood. I know that this may just seem like a bunch of platitudes, but I assure you, if you put this practice to use, you will experience an amazing change in your life, for the better. If you are not already doing this, give it a try, and let me know what happens. It will take some time and dedication, but the rewards are well worth the effort. Everything vibrates – everything. Our thoughts vibrate, sending signals that are matched and sent back to us in the form of experiences. These experiences indicate what kind of signals we are sending. Our present situation reveals the nature of our thoughts – our current frequency. Of course, as sovereign beings we are capable of consciously changing our thoughts at will, which in turn changes our vibration. Along with our experiences, the people we encounter also indicate what energies we are broadcasting. Are they nice, pleasant people? The nature of your experiences provide further signs. Would the majority of the events in your life be considered mainly positive or mainly negative? As we change our thoughts, we change our experiences. Our conversations indicate the character of our thoughts. What is the typical tone of a conversation with a friend, a family member, or a stranger? Are you more likely to talk about the benefits of the weather or the problems with it? Are you more likely to notice the good in someone or what you don’t like about them? Are you prone to harmful gossip about relatives, friends, and neighbors, or are you more likely to speak highly of them, or at least refrain from disparaging remarks about them? We draw to us what we focus on. The more we place our attention on the good in others and the benefits within the events of our life, the more we draw pleasant experiences into our lives. All events, whether we label them good or bad, positive or negative, have life-enhancing opportunities within them. How we react to what happens to us is far more important than what actually happens to us. Our world becomes a better place as we focus on the good around us, within us and within others. Experiencing good fortune is a natural way of being; the more we notice our good fortune and give thanks for it the more it blossoms – like a flower in the sunshine. The Universe always says “Yes” to what we are sending out in the form of energy, and we can easily see what we are sending out by the people and events in our life. What is your energy signature telling the Universe? If you don’t like what you see around you, it can be changed one thought at a time. Thoughts that are combined with feelings are the most powerful and have the most effect. Positive thoughts with good feelings will have a positive effect on your life, and by the same token, negative thoughts with negative feelings (hate, envy, jealousy, and fear, for example) will have a negative effect on your life. We are all creators creating our life experiences via our thoughts, feelings, and beliefs. What is your energy signature telling the Universe to provide for you? Greetings, beloveds. The energy you find yourselves in at this time is moving quickly. This is dynamic energy, which can shift in an instant, as quickly as an in-breath or out-breath. Your ability to adjust and adapt to these energy fluctuations is dependent upon your ability to remain present in the moment in a conscious manner, as an observer. As a detached observer of the process, you will be more easily removed from the discordant interactions of others, as well as from a possible bias toward inappropriate actions by yourself. It is important to remain centered and focused as these frequencies swirl around you as if you are in the eye of a tornado, where there is stillness within. You can accomplish this by remaining conscious and centered during energy disturbances in your life, such as a minor frustration with traffic, an irritating sales clerk, a pushy telemarketer, being late for an appointment and feeling rushed, or anything else that pushes your “buttons” throughout your daily activities. The moment you feel anger, angst or frustration you are at a “fork in the road,” where you can choose to take a habitual course of action or venture down an alternate route. As you become accustomed to being an observer rather than overreacting to minor situations in your life, you will develop the habit of being calm and centered in the midst of discordant energy. Hence, when confronted with a major crisis, you will automatically adopt the same posture, one of an unruffled observer, remaining calm and detached from the situation, even as a participant. As you practice on minor occurrences, pay attention to your breathing, your thoughts, and your body. Remain conscious, continue breathing, rather than holding your breath, and allow your body to release tension created by the situation, by placing your attention on the location of the tension in your body and allowing it to dissipate. At first, you may find that you have already reacted before you realized what happened. When this happens, we suggest that you replay the scenario in your mind taking a different course of action, as a calm, centered observer. As you practice on daily situations, you will become adept, responding as an observer when confronted by a challenging situation. With practice you will notice that you are responding to an event in a balanced manner: centered, maintaining a high vibration as it is taking place. Dear ones, as you practice on minor occurrences in your life, you will become the proficient master you already are; it is a matter of remembering. Ask for our assistance, and we will come forth to assist you as you take the appropriate action. Archangel Michael tells us through Ronna*Sacred Scribe that we can tell how we are doing on our spiritual journey by the people in our life and our life experiences. When we find ourselves continually dealing with challenging situations and hostile people, we are being presented with an opportunity to look within, because these occurrences are reflecting something back to us that lies within. It may be a thought or feeling that we are not aware of, that the Universe is showing us. When we don’t use these situations as learning experiences, these events tend to become more intense, until we utilize the opportunity to learn, grow and move on. If you find yourself interacting with difficult people, my suggestion is to look at the situation from a higher perspective. Find something about the person that you can appreciate, even if it is only the spark of the Creator that lies within. Or do some soul-searching to discover what that person is mirroring back to you. We have the ability to look at this as a positive event, using it to our advantage, initiating change for the better. Breathe, Center Yourself and Remain Calm. Take at least one breath and center yourself before you respond. Many times we feel that we have to respond immediately when confronted by another person or frustrating situation. Normally that is not the case; in fact, hesitation will help to defuse the situation. Do not allow the other person to draw you into a downward spiral of negative energy; remain neutral – do not allow yourself to be drawn in. Rather than allow the other person’s anger to draw me in, I prefer to allow my calm disposition to help defuse the discordant energy. Please keep in mind that this works for a frustrating situation as well as a frustrating person. This will give you time to gather your composure, thoughts, and center yourself. I like to smile (even when I’m alone dealing with a frustrating situation) and breathe. Approach the situation as if you are a detached observer, rather than someone caught up in the drama of the moment. One of the most important things to keep in mind is that when another person pushes, do not push back. Rather, allow the energy to move past you or around you as if you are encapsulated in a protective sphere – think of it like water flowing around a boulder in the river. It helps to practice with things like minor frustrations so that when we are confronted with anger, we are able to disperse the energy rapidly. 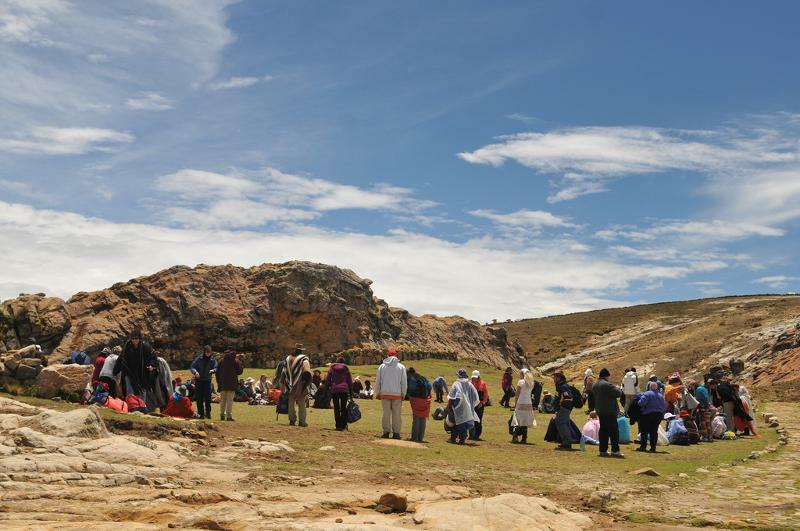 In February of 2011, I embarked on a spiritual pilgrimage to Bolivia with a group of over 90 people. 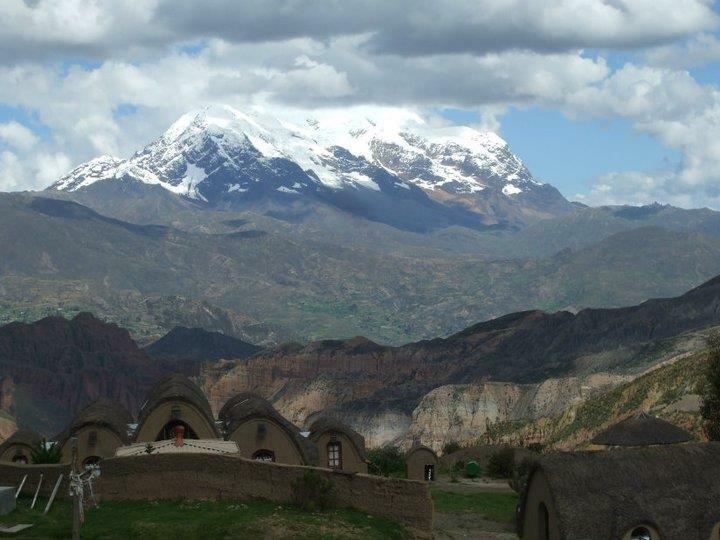 We flew from Miami, Florida, arriving in La Paz, Bolivia on February 3, 2011. I stayed for a couple of extra days, with several others, to work with a shaman at Valley of Souls. On occasion, this was a challenging trip, more for some than others. 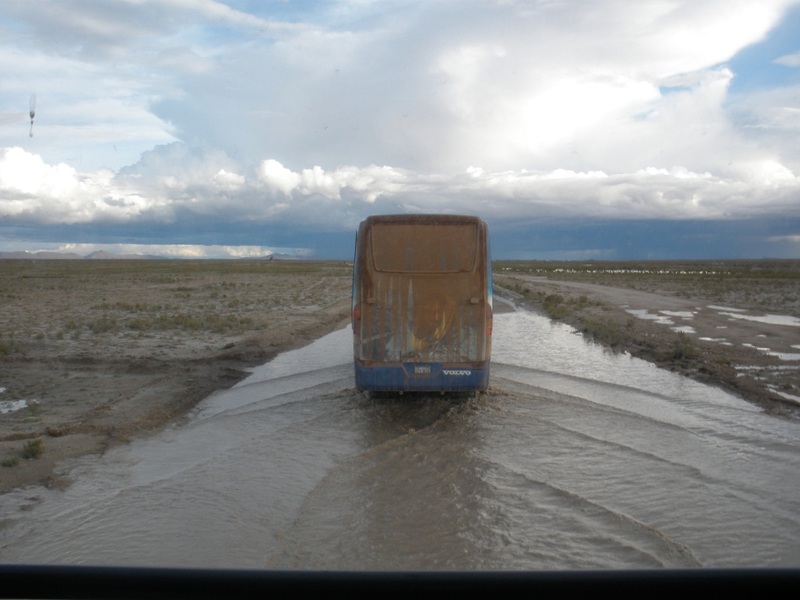 We endured many hours on buses through some muddy, sometimes pothole-ridden, and water-laden roads (I am still amazed that those buses made it). At times, as I looked out the window, the road was completely covered with water, as if we were driving through a pond. 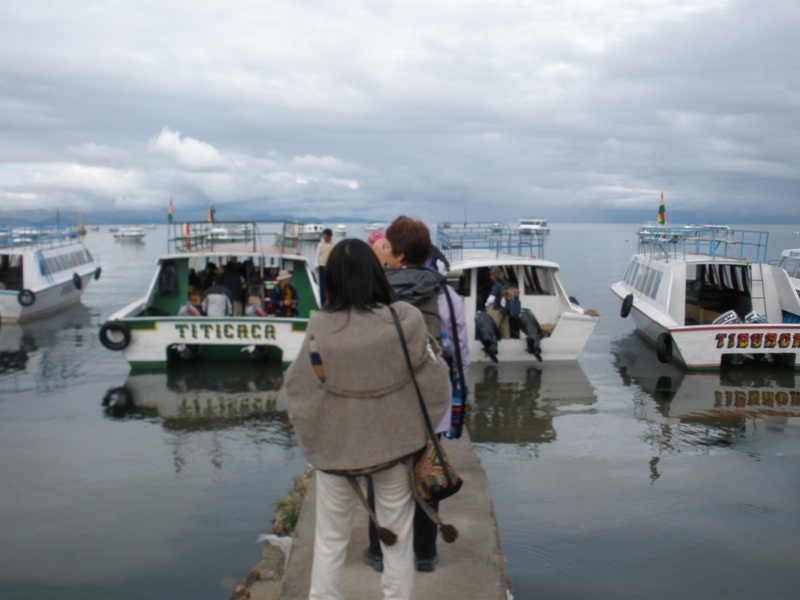 It was the rainy season; fortunately, we experienced mostly sunny days on this trip. We also spent hours in four-wheel drive vehicles, on even more rugged landscapes, sometimes where there were no roads. 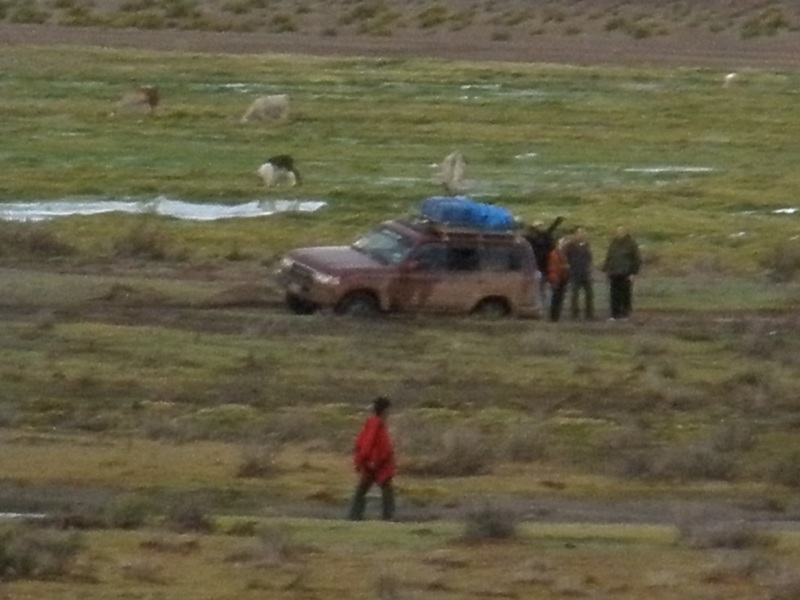 Our drivers were amazing, driving for many hours at a time, yet aptly adept at maneuvering unforgiving terrain. A four-wheel drive vehicle did get bogged down in mud once; the other drivers came to the rescue, as we looked on from the distance. Some had problems with elevation sickness. 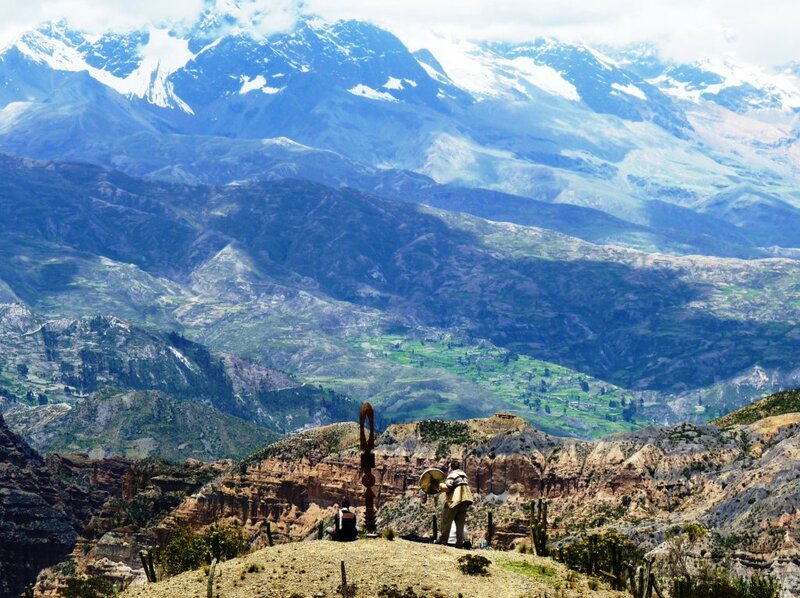 The altitude in La Paz is 3,650 m (11,975 ft), and at times we were probably above 15,700 feet on this journey. I didn’t have a major problem with the elevation but did notice that it was difficult to breathe initially until my body adjusted. I did drink quite a bit of the ever-present coca tea when it was available. It helps to adjust to the elevation. This adventure was a true test of our ability to adapt, move with the flow, and be an observer. 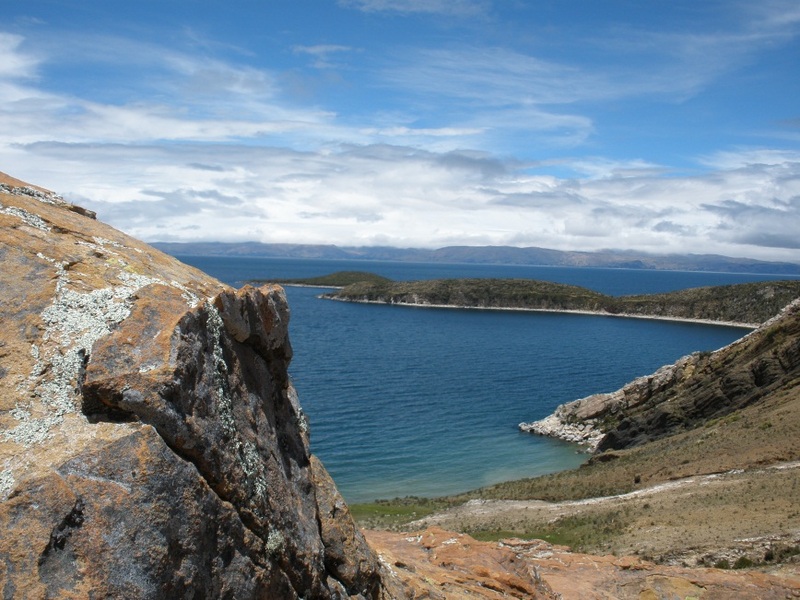 During our time in Bolivia, we visited numerous locations, namely, Valle de las Rocas (Valley of the Rocks), Laguna Turkuiri (Lake Turkuiri), Salar de Uyuni (Salt Flats of Uyuni), Isla del sol (Island of the Sun), Tiwanaku, and Valle de las Almas (Valley of Souls). I have posted some photos below. 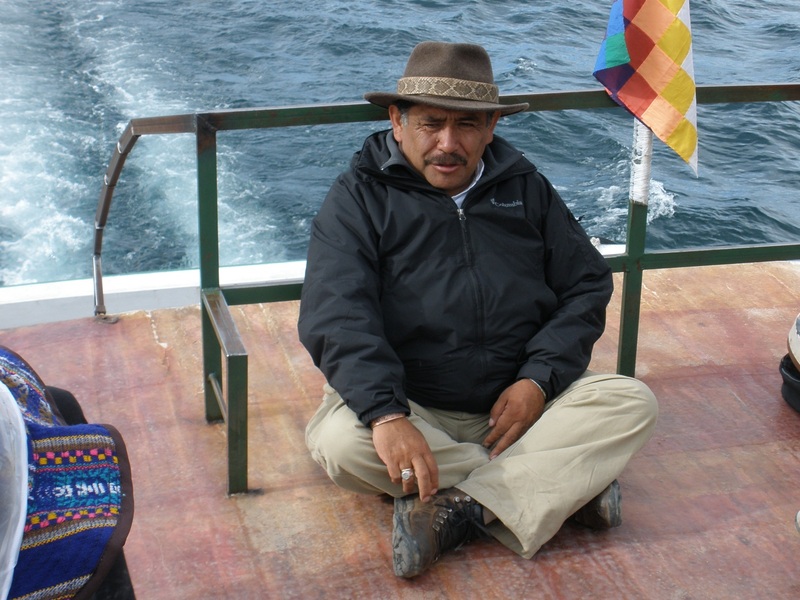 Our shaman guide on this adventure was Jorge Luis Delgado, author of Andean Awakening, an Inca guide to Mystical Peru. 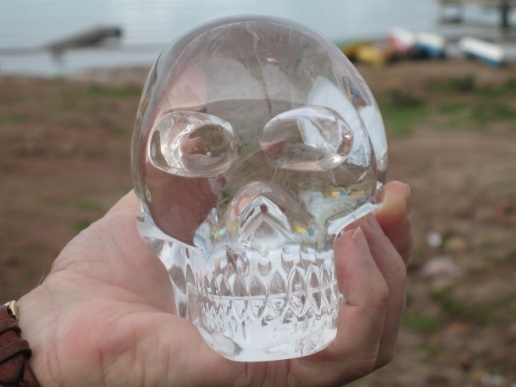 We also worked with a shaman on Island of the Sun (I don’t recall his name) and a shaman, Don Miguel Kavlin, at his center located in Valley of Souls. 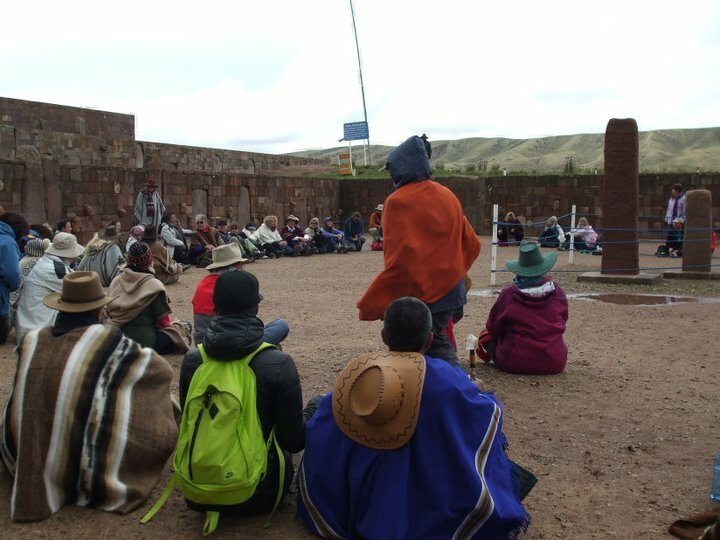 We arrived at the sacred site of Tiwanaku, Bolivia, near the south eastern shore of Lake Titicaca, on February 9, 2011. 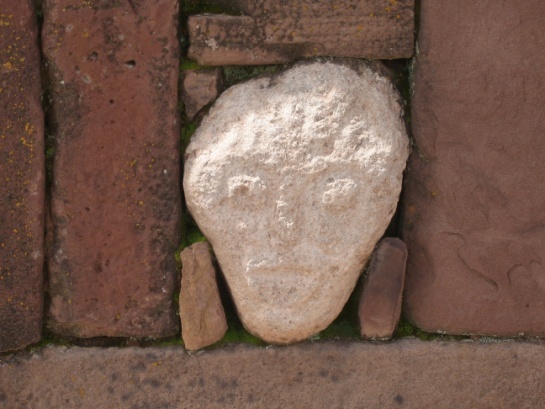 Tiwanaku is believed to be at the center of the world by some. The archaeological site of Tiwanaku (also spelled Tiahuanaco) is located approximately 71 km, about two and a half hours from La Paz. I stepped off the bus, not feeling any significant connection with this site. That did not last long. After a brief period of time, we gathered and entered the archaeological area. As I entered, a familiar feeling began to come over me; I was sensing deep emotion, as I walked the sacred ground of Tiwanaku. This happens to me occasionally when I’m at a sacred site that bears some significance for me. I don’t always know what the significance is, but I can sure feel it. The sensation is undeniable. This place touched me in a very special way. 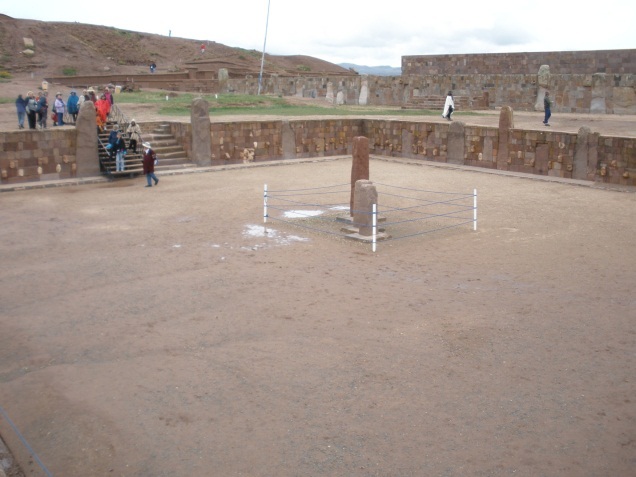 The sunken temple of Tiwanaku offered a unique experience for many of us on this journey. One story in particular, that I would like to share, comes from a dear friend Switzerland, who I met on this pilgrimage, Michele Guggisberg. Michele has graciously agreed to allow me to share her touching experience with an inner earth being. 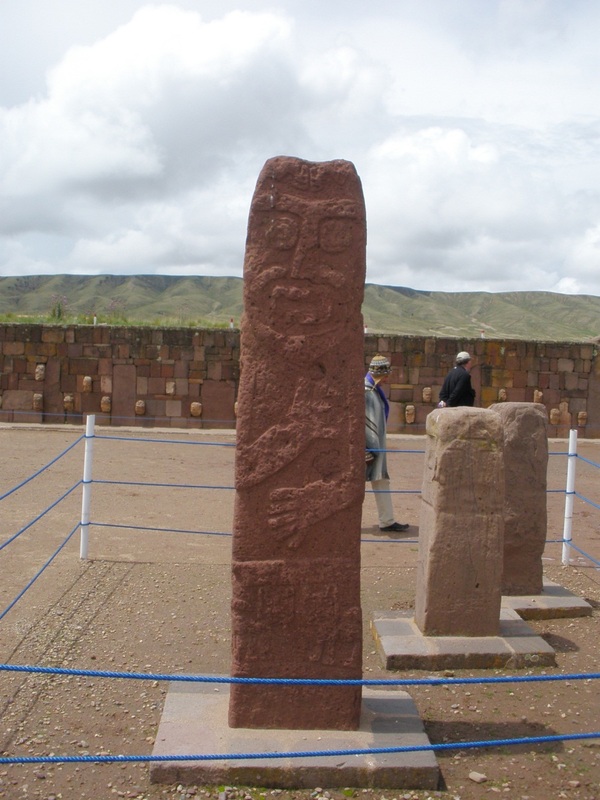 For the first time when we left for Tiwanaku (on 9.2) [February 9, 2011], I heard about beings living intra Earth. It was in the silence of our ceremony that I saw them… I would like to resume my encounter with these people and the message they transmitted to me for the ones that are interested. Eyes closed, spirit in the void, I see beings coming out of a stairway made of soil just in front of the Obelisk of the site, and at the same time Nina is channeling in their language. It is a mix of these two pictures. They are thin, approx. 1.6 m tall (approx. 5 feet), their body is like ice covered in frost; I can guess their blood stream is a darker color through their dense opaque white milky skin. They are very light and fluid in their movements as if they would be suspended just above the ground. They move in a light and fluid way. They have hollow eyes but when I look into them I see the fullness. They bring out such a happy and light impression, like curious, playful and very new children. At the same time I can feel such a wisdom and depth, as if they know everything. They seem to be so happy to see us; they smile from the bottom of their heart and dance around the Obelisk, in the center of our group. This was my first unforgettable and unexpected encounter with the blue people. I felt so honored that I was crying…. Without knowing that one of them would come back to talk to me. It happened on the boat on the way to the island of Sun. Sitting next to Nicole, I see a blue being sitting in front of us. He was laughing at us, imitating our gestures with his hands and fingers. He was laughing like a child. And then he wanted to talk to me, but how???? He wasn’t talking, so how to communicate? I was waiting and suddenly, I see a bright white ray coming out of his hollow and at the same time full eyes. This ray is directed to my 3rd eye and enters my head. In operating a zoom on this ray I can see that the ray is composed of signs, symbols, and drawings coming from him into my skull like these ones Ω ∞ π α ∏ ∑ ≈ and others more complicated. He explains to me telepathically, without words, that everything we are looking at is transmitted in symbols in our brain and each sign, symbol has its space in a drawer of the brain library and I can see an immense library, very high, filled with thousands of drawers that open and close by themselves. He explains to me that these pictures we look at are dissected in symbols which go into these drawers and this has served humanity consciousness since the beginning of times. It serves also our evolution as a soul and as a species in evolution. Then suddenly another ray comes out of his eye sockets and goes directly to my heart. It is like a liquid fluid that I can feel penetrating my heart like a gentle and emotional sensation. He explains to me that this is the functioning of the world of the feelings and the emotions–that the feelings move through liquid fluids and flow through the water of the body and the air, like waves. This is the world of feeling, and unconditional love is the master of it. And then I see the teeth which are the pillars protecting and guarding the palate, the Sacred Vault, he tells me. The vibrating sounds emitted by the movement of the vocal cords have creative power. The more the vibration is high and fast, the more the creation is fine and detailed, like flowers and butterflies. The more the vibration is low and slow, the more heavy and big things are created like mountains and elephants. So it is that these beings communicate by telepathy, they create with their voice into the manifestation and keep their knowledge in their mental library. They exchange their feelings by the world of fluids. What privilege…. What gratitude….. As one goes along I explained to Nicole what I received, she could follow my words in also seeing the pictures or in sensing the sensations. It was magical and still today I can hardly believe it! “The Return of the blue blooded people” could be the title of a book which may be written through me. To be continued! Obelisk Michele refers to… Per our shaman guide, Jorge Luis Delgado: hand on the heart – love, hand on the abdominal area – with no fear. Center where we stayed at Valley of Souls and worked with shaman Don Miguel Kavlin and his wife, Carmen (yes, they were like hobbit dwellings). 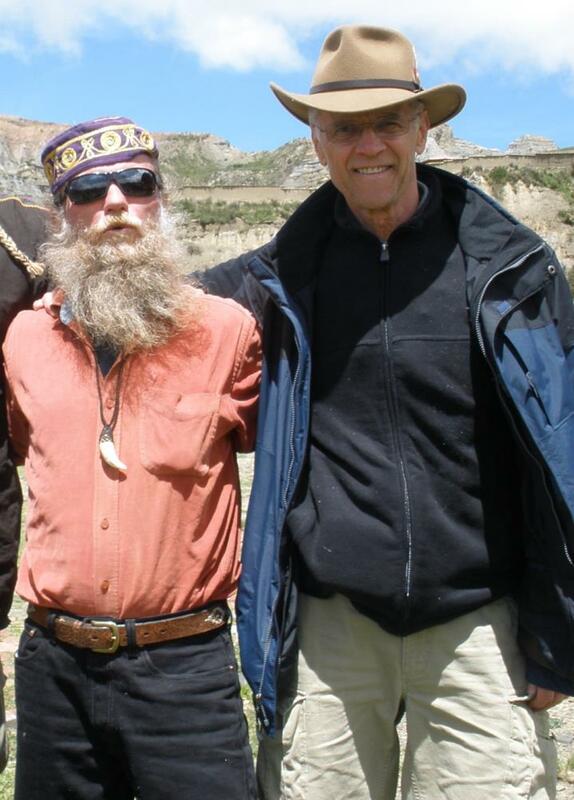 Valley of Souls shaman Don Miguel Kavlin & yours truly. Mount Shasta is situated in the Cascade mountain range of Northern California. With an elevation of more than 14,000 feet, it is the 2nd highest volcano in the High Cascades family of volcanoes (bested only by Mount Rainier) and the 4th highest volcano in the continental United States. This lone, snow-topped beauty is actually what is called a compound stratovolcano: a tight family of overlapping volcanic cones. Shastina is another cone that sits right alongside Shasta. President Theodore Roosevelt said it was “one of the grandest sights” he’d ever witnessed. I first went to Mount Shasta in 1997… and this sacred mountain has been one of my favorite places on the planet ever since that visit. I have spent time on sacred Mount Shasta many times since then. Since my last visit to Mount Shasta have been reminded of the 2012 seminar I co-facilitated with a friend. There were twenty-one of us in attendance. It was too beautiful and serene a setting not to be celebrated in some small, special way, so on the morning of September 23, 2012, fourteen of us held a sunrise ceremony in Mount Shasta’s postcard-like tranquility. We completed our ceremony, satisfied, and proceeded in three cars to yet another location on the beautiful mountain. We decided to drive a little way back down the mountain to another site that two people in our group were familiar with. Driving down the main mountain road, we took a left turn, on a stretch of dirt road that led right into the forest. The splendor outside and the anticipation of approaching this sacred place was spellbinding. After a short drive, we were more than ready to park our cars and step outside once again. We had just approached the edge of the road when Betty, a member of our intuitive group, sensed an unseen barrier and informed us we needed to have permission to enter. She asked me to make the request… so I did. We were granted permission, and we proceeded into the wooded area. We found ourselves in a forest of mostly pine – and possibly cedar – trees, with huge boulders as well. As I walked deeper into the forest – a little farther from the road now – I began to feel a connection which resulted in some deep-rooted feelings and swelling emotions that I find quite hard to articulate. It almost felt like I was longing for something I’d lost long ago, or remembering something that had once been intimately familiar to me, but I couldn’t quite figure it out. I did not know what it was, but I know that it concerned the underground city of Telos and its inhabitants. I looked over as Betty walked onto a huge boulder; she stood there, looking outward: facing the forest like a familiar sentinel. I took a seat on a smaller rock about five to eight feet behind and to her right. We all stood or sat there in complete silence. You could have heard a leaf hit the ground. It felt as if time had stopped. I was home… we were home. And as if on cue, after delivering the message, I was once again overcome with emotion – which happens to me sometimes after channeling a message to a group of people. This time, however, was different. This time, the emotion and the connecting force and incredible love that I felt was much stronger than I ever remember feeling in the past. This was a unique experience for me, as normally I have a procedure for channeling; this time it was spontaneous. It was spontaneous… but not totally unexpected, because I had been feeling Adama’s presence from time to time leading up to my trip to Mt Shasta. Leading me – leading all of us – home. My first visit to Mount Shasta in 1997 was special to me. One of the reasons it was so special was because was it was the first time I saw Ronna Herman Vezane (who was to become my dear friend and mentor) deliver a message from Archangel Michael during the Wesak Celebration which I had gone there to attend. As you can see, Mount Shasta already had its place in my heart; that blessed trip had just made it all the more special. The thymus gland is behind the top of your breastbone (sternum) and is responsible for producing mature white blood cells which fight the common cold as well as infections and serious diseases; it has a major impact on your immune system. Performing the thymus thump helps to stimulate the thymus gland and keep this critical gland at peak performance. It is said the thymus thump helps to release fear as well. Perhaps that’s why gorillas pound their chest, to show that they’re not afraid. Increase your life force energy. 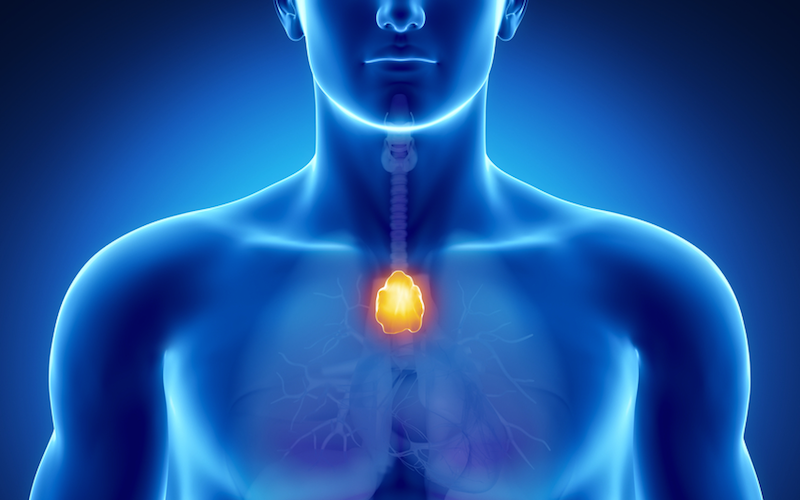 It’s recommended that we perform the thymus thump 1-3 times daily. I normally start with one deep breath. Make a fist with your thumb against the outside of your index finger. Gently strike your sternum with the inside of your closed fist. This creates a vibration which will stimulate your thymus gland. Rapidly but gently thump your sternum from 60 – 100 times in about 30 seconds or so. Then I say “I am thankful (or grateful) for my healthy, stimulated and active thymus gland and all of its benefits” as I place my open hand on my chest over my thymus gland, palm down.